Students learn and retain more when they are having fun! 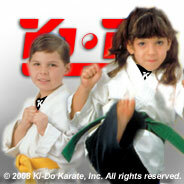 Ki-Do Karate is good, clean fun for kids...and a great way to give kids a head start in life. At Ki-Do Karate, Inc., they will learn the positive benefits of self-discipline and confidence, develop coordination and increase strength and flexibility. Because respect is such an integral part of the martial arts, children develop the ability to listen, learn, and achieve within a highly structured environment. This proves to be an excellent reinforcement of study techniques for school.